We offer a cordial welcome this evening to our old friends and rivals, Hibernian F.C. from Edinburgh, with whom we have had some we have had some thrilling matches in the past, and we look forward to another such encounter. It is our second meeting with them in the newly formed series of Anglo Scottish floodlit Challenge Matches, the first match having been played in Edinburgh on Monday September 17th when we were winners by 5 goals to 1. 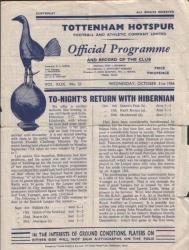 Last Season, like ourselves, Hibernian had their problems, and the season was one of transition and of building-up for the future and recruitment of new players, but when the league programme was completed they can look back with satisfaction on their efforts for they finished fourth in Division “A” of the Scottish League with 45 points from 34 games played. 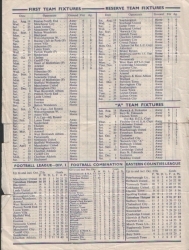 Their top goal scorer was Lawrie Reilly with 34 goals, 24 in the League and the remainder in cup matches. Reilly was again a prominent international figure with Gordon Smith and Tom Younger, now with Liverpool. They have been considerably handicapped by injuries, but the three sucessive drawn games have helped Hibs to find their feet, and have given the team a considerable boost in morale. The defense in now more solid than it has been all season owing mainly to the return of John Paterson at center-half. Paterson received and injury – a cracked fibula – in the first game of the season, and only resume three weeks ago. 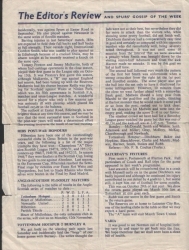 With young George Muir playing so weel as his deputy left back paterson, who played for the Scottish League in 1955, has reverted to center half, which was his original position. Muir playered in the League team only once last season, but has made tremendous progress since stepping up on August 18th. The goalkeeping position has inadvertently been in a state of flux since the close season transfer of Younger to Liverpool. That is not through the lack of good ‘keepers’, but is caused by two of them, Jack Wren and Lawrie Leslie, being at present in the services. Wren, who played recently for the R.A.F. against an F.A. XI at Sheffield, is stationed near Blackpool, while Leslie is with the royal artillery at Coventry. It is possible that neither may play tonight, and in that event the job will fall to young John Proudfoot, who lives and works as a joiner in his father’s business literally in the shadow of the famous Forth Bridge at South Queensferry. 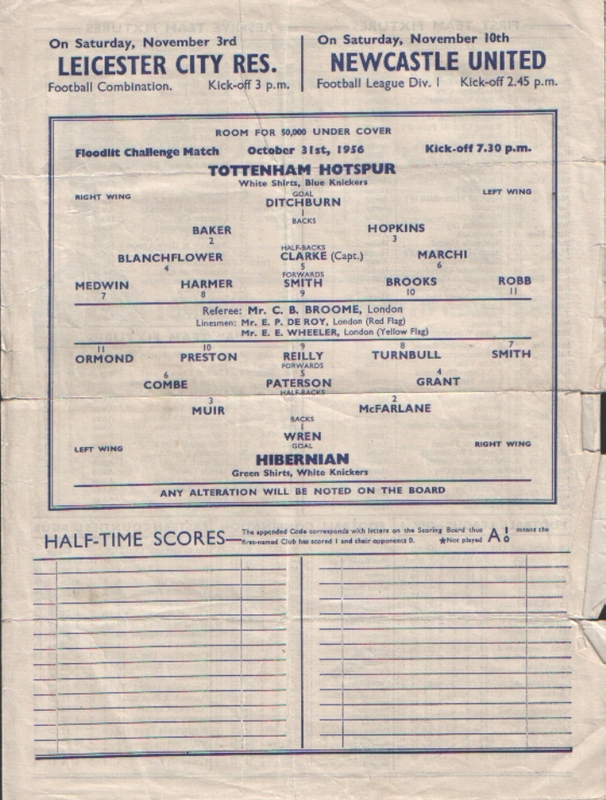 John’s first game in the first team, incidentally, was against Spurs at Easter Road in September. 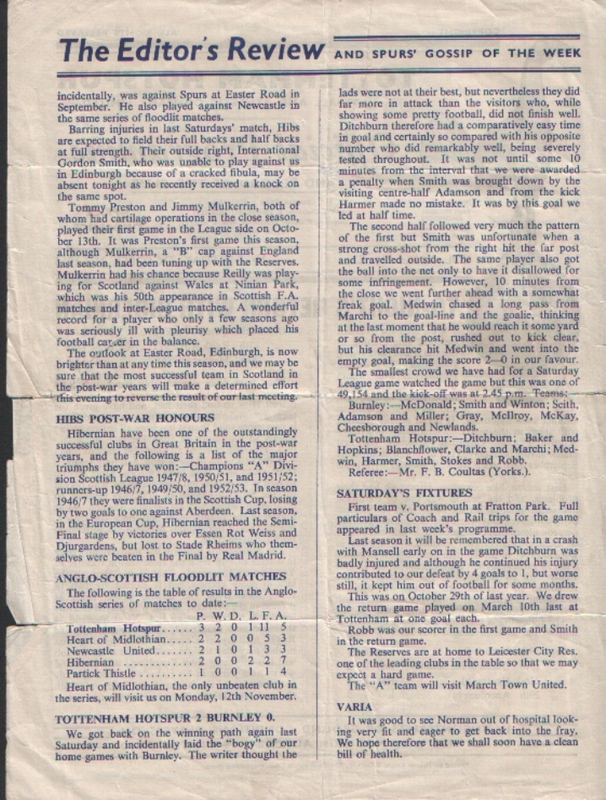 He also played against Newcastle in the same series of floodlit matches. Barring injuries in last Saturdays’ match Hibs are expected to filed their full backs and half backs at full strength. Their outside right international, Gordon Smith , who was unable to play against us in Edinburgh because of a cracked fibula, may be absent tonight as he recently received and knock on the same spot. Tommy Preston and Jimmy Mulkerrin both of whom had cartlidge operations in the close season, played their first game this season in the League side on October 13th. It was Preston’s first game this season, although Mulkerrin, a “B” cap against England last season, had been tuning up with the reserves. Mulkerrin had his chance because Reilly was playing with Scotland against wales as Ninian Park, which was his 50th appearance in Scottish FA matches and inter-League matches. A wonderful record for a player who only a few seasons ago was was seriously ill with pleurisy which placed his football career in the balance. The outlook at Easter Road , Edinburgh is now brighter than at anytime this season, and we may be sure that the most successful team in Scotland in the post war years will make a determined effort this evening to reverse the result of our last meeting. 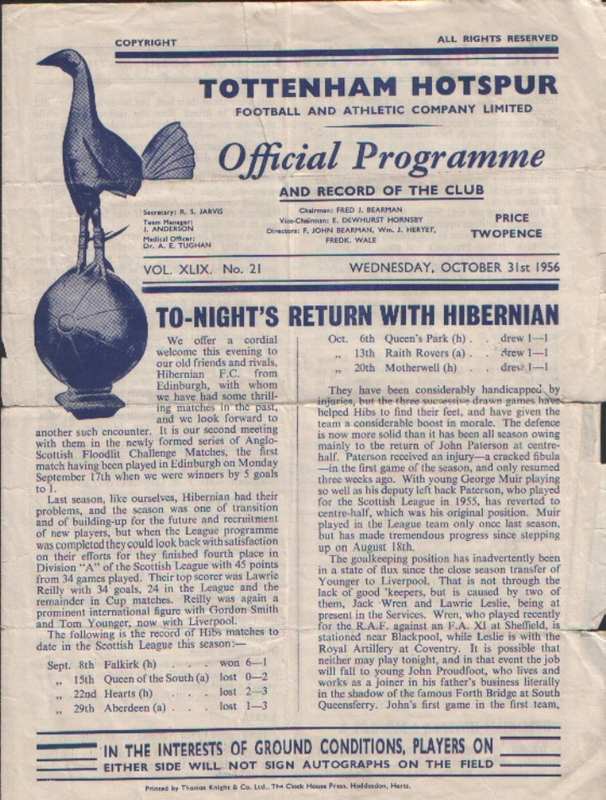 Hibernian have been one of the outstandingly successful clubs in Great Britain in the post war years, and the following is a list of the major triumphs they have won:- Champions “A” Division Scottish League 1947/48,1950/51 and 1951/52; runners-up 1946/47,1949/50 and 1952/53. 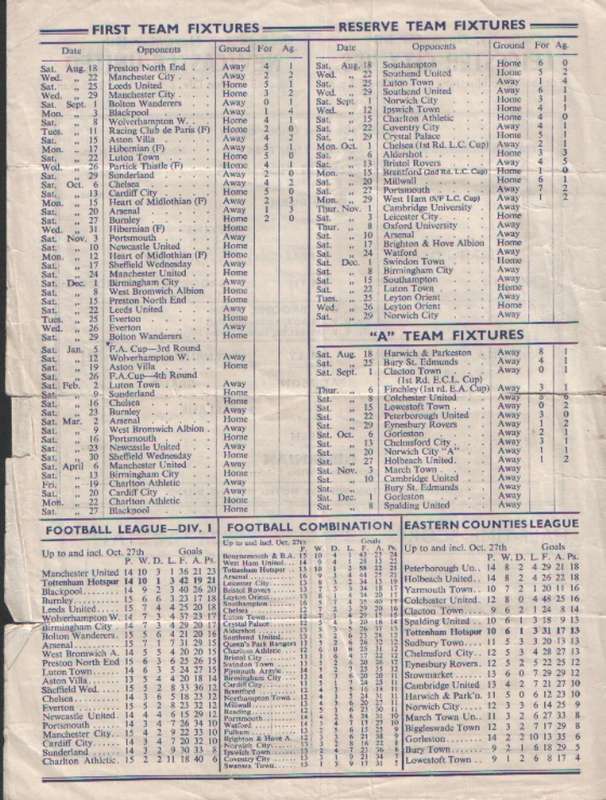 In season 1946/47 they were finalists in the Scottish Cup, losing by two goals to one against Aberdeen. 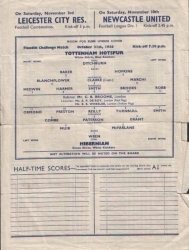 Last season, in the European Cup, Hibernian reached the semi-final stage by victories over Essen Rot Weiss and Djurgardens, but lost to Stade Rhiems who themselves were beaten in the Final by Real Madrid. Heart of Midlothian, the only unbeaten club in the series, will visit us on Monday, 12th November. TOTTENHAM HOTSPUR 2 BURNLEY 0. We got back on the winning path again last Saturday and incidentally laid the “bogy” of our home games with Burnley. The writer thought the lads were not at their best, but necertheless they did far more in attack than the visitors who, while showing some pretty football, did not finishwell. Ditchburn therefore had a comparitively easy time in goal and certainly so compared to his opposite number who did remarkably well, being severly tested throughout. It was not until some 10 minutes from the interval that we were awarded a penatly when smith was brought down by the visiting center half adamson and from the kick harmer made no mistake. It was by this goal we led at half time. The second half followed very much the pattern of the first but Smith was unfortunate when a stron cross-shot from the right hit the far post and travelled outside. The same player also got the ball into the net only to have it disallowed for some infringment. However, 10 minutes from the close we went further ahead with a somewhat freak goal. Medwin chased a long pass from Marchi to the goal-line and the goalie, thinking at the last moment that he would reach it some yard or so from the post, rused out to click clear, but hi clearance hit Medwin and went into the empty goal, making the score 2-0 in our favour. Gray, McIlroy, McKay, Cheesborough and Newlands.